Today, Taylor and Drew are discussing Deadpool Annual 1, originally released September 28th, 2016. As always, this article contains SPOILERS. Taylor: As a kid, I was a cartoon addict. I would wake up at 6:00 am every day for the sole purpose of watching cartoons for an hour before school. Needless to say, Saturday morning cartoons were like manna from heaven for me. Being young, I watched these cartoon shows for hours on end indiscriminately. In retrospect, much of the shows I watched were truly awful, sporting low production values and shoddy writing at the best of times. Still, I fondly remember these cartoons, and I’m willing to bet most children of the ’80s look back on these cartoons through a rosy lens like myself. In the Deadpool Annual, writers Gerry Duggan and Brian Posehn take a look back at these shows and wonder what would happen if the Merc with the Mouth had gotten his own crack at Saturday morning. 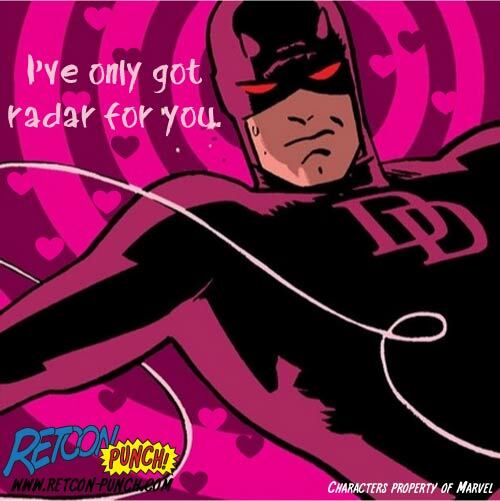 Retcon Punch is for Lovers; Happy Valentine’s Day! February 14th is about three things: socks with hearts on them, discount chocolates on the 15th, and corny Valentines cards for your friends. We can’t really share the first two with you, our loyal readers, but boy can we share the third! A couple years ago we made a bunch of corny Valentine’s Day cards, and we had so much fun we did it again last year. Because we’re once, twice, three times a lady, we’ve done it again and made a new batch of Valentines for you all. Feel free to print and pass them out to the nerds you love the most, just keep our name on them, huh? More after the break. Today, Taylor and Drew are discussing Deadpool 41, originally released January 28th, 2015. Today, Taylor and Patrick are discussing Deadpool 40, originally released January 14th, 2015. Today, Drew and Taylor are discussing Deadpool 38, originally released December 3rd, 2014. Today, Spencer and Scott are discussing Deadpool 28, originally released May 14th, 2014.